Once tomorrow hits, there are two big films hitting theaters that could become blockbusters. Well, at least if they’re based on their gorgeous scores. First up is Clint Mansell’s score for Noah, the biblical epic directed by Darren Aronofsky. It comes out tomorrow, but the score is up on Spotify for streaming now. It doesn’t take long to realize Mansell’s pieces erupt with dramatics. One look at the film trailer and you should have known that already (or one look at the title of the songs, like “The World Was Filled With Violence” and “The End of All Flesh is Before Me”). The other score is done by Mica Levi for Jonathan Glazer’s eerie sci-fi flick Under the Skin. Scarlett Johansson stars in the film as a voluptuous woman dropped on Earth and roaming around for men as prey. Give the trailer a spin here and then imagine all these images with Levi’s beautiful synth rhythms and cosmic imitations. 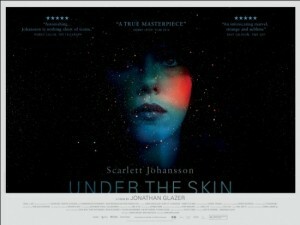 Under the Skin is out now in the UK and comes out in the States on April 4. Head over to Pitchfork Advance to stream it in full — and consequently let your jaw drop. Which of the two do you prefer? Comment in the section below and battle it out, composer versus composer-style.